A lot of customers ask me for roll wrap. I do stock rolls and they are fabulous. Unfortunately with postage prices being what they are it isn’t cost effective to offer it for sale on my website as the postage would cost more than the wrap itself. However, if you live in the Western Isles or round the Black Isle/Inverness area then I can probably arrange delivery for free. With that in mind here is some of the roll wrap I have. If you’d like some please get in touch and I will do my best to sort you out. 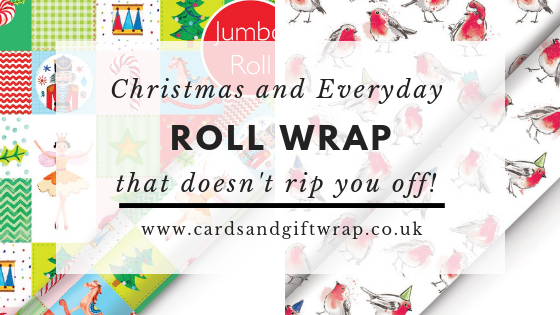 It’s all fabulous, gorgeously designed and quality wrap that won’t rip or tear easily when wrapping. If you see something you like please contact me to arrange delivery, or email me at janet@cardsandgiftwrap.co.uk. Cromarty. The place of my childhood and where I still call ‘home’ or ‘where I come from’. If you haven’t been or heard of it, it’s a smallish town on the Black Isle just North of Inverness in the Highlands of Scotland. It’s one of those places, which, although it has a fairly small population, as one of my aunties once said to me; it doesn’t matter where you go you will meet someone with a Cromarty connection. Of course all the opinions expressed in this article are my own and as such completely biased. Perhaps even more so now I no longer live there. Though I visit as often as I can, I see the town through rose tinted glasses and my memories of childhood are only the happy ones. Nevertheless it was, and still is in the minds of my children, the best place to spend a childhood, especially in the summer holidays. The freedom to wander to the park, the beach or the bakery is something my children cherish as much as I did. Perhaps I took it more for granted than they do. It was an everyday event for me, not the occasional holiday treat it is for them. So this month I challenged myself to compile a Cards and Gift Wrap box that reflects my memories of childhood summers in my home town of Cromarty. The designs I chose to put in my box have all been inspired by different memories of my Cromarty childhood. I can just about remember my dad helping with the salmon fishing. I certainly remember seeing the huge salmon nets drying on the Links. When I was young the pier was stable enough to fish off the very end of. You could also climb down the steps at low tide and pick muscles off the structure for bait. Or sit underneath the pier at low tide and pick up a star fish or two and watch crabs scuttling about. Perhaps it wasn’t stable enough but there was no health and safety that I remember. Nowadays most of the steps have worn away. I certainly wouldn’t be letting my children climb down them as I did. Is that because they are less safe or because we are more cautious, perhaps a bit of both. One of my fondest memories is going for a walk up the Sutor (the hill that sits behind and overlooks Cromarty) with my aunties and picking blaeberries. There was no need to take a picnic as we just stopped half way and ate as many blaeberries as we could. They were all around us. There was no thought of taking any home, it was just free food in the wild. I have taken my children up the same place but they have been more interested in wild raspberries and brambles. Collecting them, at least the ones we didn’t scoff, and taking them home for bramble jam. Oh and that reminds me of another fond memory. Going round to an auntie’s of a Saturday afternoon and being given custard with a dollop of homemade bramble jam. I can still taste it now. Then there was all the fruit in our garden. My mum is still in the same house, the fruit is still there. Cooking apples, eating apples, plums, rhubarb, strawberries, all growing in abundance. It’s no wonder that rhubarb crumble, closely followed by apple crumble, is my favourite desert even now. Cromarty is known for being a good place to grow fruit, especially fruit trees. The Black Isle is very fertile land. The climate in Cromarty combined with the soil seems to make good for fruit in particular. As you drive out the shore road from Cromarty towards Jemimaville (its sister town of Barbaraville is across the Cromarty Firth), you will often see at least one pair of swans swimming or nesting along the beach beside the road. Swans, as you probably know, mate for life. I don’t know what their life expectancy is but it always appeared, even now, to be the same pair nesting each year with a family of Signets in tow. ships in from the Moray Firth to the Cromarty Firth for about 160 years until being discontinued in 2006. Most of the buildings now belong to Aberdeen University and form a marine research centre. The Lighthouse was significant to me not because it is so prominent and sits round the corner from our house but it was also right across the road from the ‘family home’ on my father’s side. There is something familiar about it and sight of it reminds me of my father standing in front of it, at the top of the Links looking out to sea. Perhaps looking for dolphins, contemplating what the weather was bringing, watching a tug or oil rig or perhaps just watching. I forget that not everyone grows up watching dolphins swimming past the end of the street on a regular basis! Porpoises and dolphins were a common sight. It was quite common to see a school leaping in and out of the water in and out of the Firth. I have often stood on the beach and watched one leaping maybe just a few metres in front of me. Locally they are known as tumblers. Since moving to the Outer Hebrides I find that the Gaelic for dolphin, leumadair means jumper. I wonder if the two names are related. Perhaps it is just typical of how we name animals from their behaviour in many cultures. Certainly in Cromarty the dolphins were there long before the Gaelic came but that’s a story for another day. find fossils. Hugh Miller, a local geologist, was famous for his discoveries and you can visit the place of his birth, Hugh Miller’s cottage. I have fond memories of day trips walking the steep path down to Eathie beach. Less fond memories of lugging a bag full of fossils home. There is still a Salmon fishing bothy there where at one time my father would have worked. Bed, an old smuggling cove, pirates again right? These are the stories I still tell my children. If you want to spoil your imagination and know the truth then you can find out more here. For those who buy my subscription box every month there are always a few added extras. This month I added some flip flop stickers. Every year my flip flops hurt my feet. That bit between the toes was never comfortable and yet every year I bought a new pair of flip flops from my auntie’s shop with the dogged hope that this year they’d be better. Every August is the Black Isle Show, one of the largest agricultural shows in Scotland. All I remember from going as a child is the helter skelter. It’s the only ride I would go on! I’ll be at the Black Isle Show in August in the craft tent. If you’re in the area please come along and say hello. So what’s Cromarty got to do with cards and gift wrap? Every month I put together a deluxe subscription box on a theme. The box contains gift wrap, cards, gift bags, tissue, ribbon, tags and other extras. 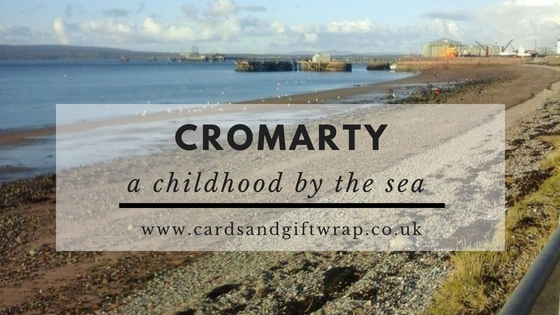 This month I have chosen ‘Cromarty’ as my theme and have picked cards and gift wrap which reflect my childhood memories of Cromarty. It’s been a delight to put together and the hardest thing is knowing where to stop. If you’d like a box you can pre order yours here. I hope it will help me to make sure something of Cromarty is gifted far and wide. I also hope that one day you will have the pleasure of visiting Cromarty and seeing it for yourself. Flamingo Paperie present you with cards, gift wrap, charity Christmas cards, traditional advent calendars and stationery that are well known for their beautiful illustrations and great quality. Buy Flamingo Paperie cards here. I am an Independent Executive Flamingo Partner. I sell the fabulous Flamingo range of cards, gift wrap and stationery and I also stock other non Flamingo items such as colour in tablecloths and other gift wrap on this website. You can become a Flamingo Paperie Partner too! Become a Flamingo Paperie Partner today. Choose from three special start up packs, each containing everything you need to start your business at the level that’s right for you. Fill in your name and email and I’ll send you the information you need to start today. I would love to have you on my team. If you want to receive exclusive special offers, sneak previews and information about new releases as they happen and/or the latest Flamingo brochure then click here. If you really love Flamingo Paperie then you need to also join my Flamingo Customer Club and you’ll get a free gift with your first order in my Flamingo Shop. The new Flamingo Paperie range is out now. We had an exciting Christmas range for 2018 including our traditional advent calendars and our well-known advent calendar cards. New products come out about 5 times a year. If you’d like the latest brochure just ask. Click here to see the Christmas 2018 range. You can still get hold of a few Phoenix Trading products. Just ask me if there is something from the old range you want to get hold of. I may well have it in stock and if not I’ll do my best to find it! If you have questions about becoming a Flamingo Partner then perhaps my FAQs will help. Get in touch and we can work out what’s best for you. Contact me today to be the first to get involved in this exciting venture. Join my fabulous Flamingo Paperie team either as a customer or a partner. Let’s work together to build something great. Sign up now to my new Customer Club if you would like me to send you special offers, sneak previews. You can also be involved in the design of new products and more. If you’re looking for information on submitting artwork then take a look at Artists Wanted!